Senator Elvi Gray-Jackson began her public service career with the Municipality of Anchorage at the Public Transit Department 37 years ago. In 1988, she began working for the Anchorage Assembly. Her service began first as an Administrative Assistant, then as Senior Budget Analyst and, finally, as Director of the Budget and Legislative Services Office. In 2005, Elvi worked for Municipal Light and Power as Director of the Alaska Energy Railbelt Authority; a joint action agency with three electric utility members. Elvi served on the Anchorage Assembly (Midtown-District 4) from 2008 to 2017. She was Vice-Chair from December 2015 to April 2016, and Chair from April 2016 to April 2017. 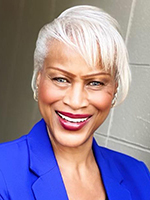 She also served on the Board of Directors for Boys and Girls Club of Alaska; Woodside East Homeowners Association; the National League of Cities (NLC) Board of Directors, and the NLC Finance and Investment Advisory Committees. Elvi has been a speaker at UAA for several years, providing students with Municipal hierarchy and budget issues. She is also a mentor for young people, as well as serving twice as an agency supervisor for the social work practicum program. She is a recipient of the Women of Achievement Award and is a recipient of multiple other distinguished awards and recognitions. Elvi is a graduate of the University of Alaska, Anchorage, and has one son, Ramon.